Somehow the picture of my son posing with one of Joe Arpaio's new recruits got messed up in an earlier post. I know you all were desperate to see it, so here is the repaired image. Isn't that guy a little short for a storm trooper? Lucas got most of his threats from state control wrong in Star Wars, but the outfits were cool. Is that storm trooper not an "alien"? Are you sure he works for Joe? dammit david, you beat me to that one. 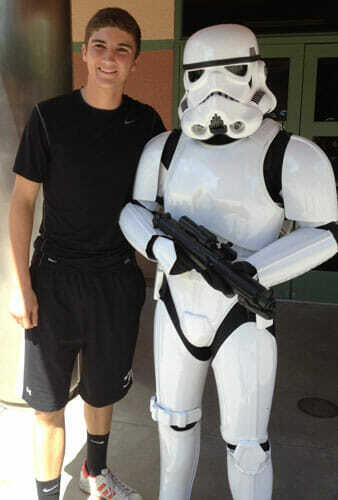 Isn't he a little tall to be a Storm Trooper? >>> Isn’t that guy a little short for a storm trooper? LOL, wrong line. Hamill got that line because he's only 5'9". I'm guessing Warren's son is fairly tall, so that would suggest, since the Trooper is almost as tall, that the Storm Trooper is too tall. Assuming you use the height of Boba Fett's character in SW5/6, that actor is 6'1", which should be the height of all the Troopers, for reasons that should be obvious. Warren, how does that compare to your son and the guy in the picture? Is the Trooper the right height? Now, is THIS a geek discussion, "or what"? Bodges? We don' need no steenkeeng bodges!